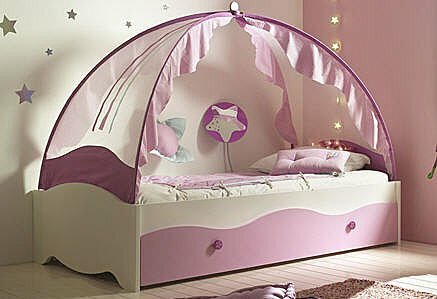 Fairytale Canopy Beds For Your Little Princess! Each of us are very familiar with ancient legendary and beautiful fairy tale stories, which tells us about luxurious life styles of different people, kings, princesses, queens who have lived with the embodiment of luxury around. Their bedrooms were the most comfortable and luxurious with full of high quality cushions, pillows, flowing flimsy draperies and canopy recline beds. They always used to have these canopies to decorate their beds, couch and ceremonial throne to show a symbol of power and luxury. From that ancient time, we have still left over with the habit of using canopies in master or guest or kids rooms as a decorative piece or in kids rooms for them to give a feel of comfort and secure. In recent times, this luxurious decorative piece is very much popular in making kids rooms as always they love to live in fantasy world. So I thought why can’t go in deep and find some extremely adorable canopy beds to fill this page as an inspiration for your next project of making a girl’s bedroom. Which girl will not enjoy and feel like a princess, having one of these four poster canopy bed which gives them the coziness, secure feeling and touch of luxury. Made out wooden white bed from the furniture store with these extremely adorable pink and white theme frill canopy drapes have given the real fairytale look to the room. You can again make your little girl feel like a princess with this charming, cottage style two tone, poster canopy bed from the furniture store. Doesn’t it look like it has come from a fairytale with each features, like the panel style headboard and footboard adorned with pine finished elements, four tall and fluted posts and a canopy with the look of hand painted flowers and ribbons detailing. Again different style of a canopy, a crown style! A crown style canopies make a dramatic statement to any room with its cute and simple look. It is created by long fabric or net fabric panels fall from under a valance mounted to the wall. To your your little princess a real princess canopy carriage to create a real magical kingdom from Disney. 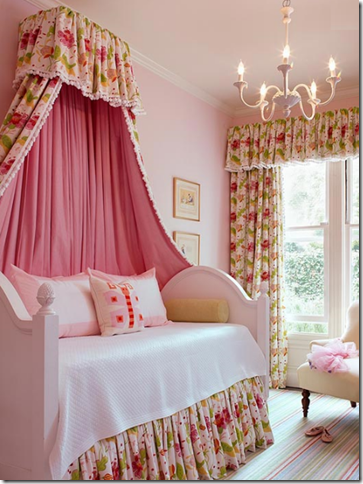 This unique beautiful princess canopy bed shaped in carriage shape with flimsy net drapes around and finished in their favorite color pink. And also it has featured all their fairy characters and rooftop fairy lights that creates a sparkling finish to the bed. For the sweet little princess another totally adorable whimsical pumpkin carriage canopy bed designs to start dreaming all over again. These beds are made of metal and wood with totally soft and smooth fabric canopy materials, creating and giving the image of Happily Ever After.